I have been asked by Olaf Schubert, president of the Northern Beaches Festival Assoc, to publicise some up and coming fishing competitions associated with the Northern Beaches Festival 2010. There are 3 competitions that are being run. * May 1st to May 28th - Club Competition. 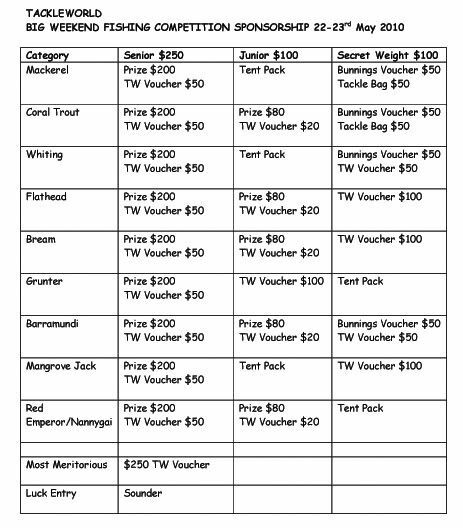 Member for Hinchinbrook Challenge for all clubs in the Cardwell to Townsville area. * May 21st 4pm to May 23rd 3pm - Tackle World Open Competition. * May 23rd - Pro Tackle Junior Beach Fishing Competition at Balgal Beach. Brochures and registration forms are available for download below.